The 2017 Legacy Genealogy Cruise - an annual event in its 14th year - is pleased to announce that professional genealogist and technology educator Thomas MacEntee (and popular webinar speaker) will be joining the event as its featured speaker. The 7-day genealogy cruise takes place beginning September 22, 2017 and visits the Pacific Coast on Royal Caribbean’s luxurious Explorer Of The Seas ship. Over a seven-day period, MacEntee will offer presentations related to genealogy technology. He will join Legacy Family Tree’s Geoff Rasmussen and others who will offer classes on Legacy and other genealogy methodologies. The 14th annual Legacy Genealogy Cruise, starts in Seattle, Washington and visits Astoria, Oregon; San Francisco, California; and Victoria, British Columbia. For more information, or to register, visit http://legacyfamilytree.com/CruiseInfo_2017.asp. Not only will you have the vacation of a lifetime, but you will do so in good company with other genealogists. Transportation to Seattle, port charges, gratuities, government fees/taxes, and optional tours are extra. Click here to learn more or to securely book your cruise online. To reserve a cabin, or ask questions, contact our travel coordinator, Christy, at 1-425-222-6222 or send an email to LegacyFamilyTreeCruise@gmail.com. For class descriptions, frequently asked questions, descriptions of the places we'll visit, or pictures of our past cruises, visit http://www.legacyfamilytree.com/CruiseInfo_2017.asp. We have returned from our 13th annual Legacy Genealogy Cruise and had the time of our lives! We sailed on board Royal Caribbean's Radiance of the Seas for 7 days throughout beautiful Alaska. ...and lots of ice cream. And to top it off, I made an exciting genealogy discovery while waiting for my flight home. We ended the classes as we always do by drawing lots of names for door prizes. We then announced that all Legacy cruisers would get a free annual webinar membership and a free copy of Legacy 9 (whenever it's released...). Thanks to all of you who joined us! Thanks to all the rest of our Legacy Family Tree staff who kept our Support, Customer service, and Shipping departments open while we were away. And thanks to our cruise coordinator, Christy, for all she did for us too! Write to Christy for more information at legacyfamilytreecruise@gmail.com. Now that I've officially announced our return, it's back to work! 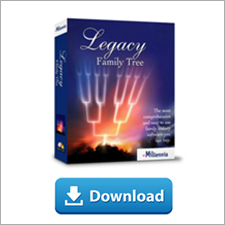 We've got great things planned for our Legacy Family Tree software and for our webinar series. I LOVE my job! Today, in Skagway, Alaska, the 4th day of our Legacy Genealogy Cruise, has gone down as the day that I faced one of my biggest fears head on, and I was triumphant. There honestly was a little part of me that questioned if I would be here afterwards and wow does it feel good to have accomplished what we did. I'm certain that somewhere in my recent DNA test it shows that I have an extraordinary fear of heights. After today, I'm convinced that I must also have a courage gene, and it took every bit of that courage to do what we did. As my wife and I stood together at the top of the 200-foot cliff and were preparing to step over its edge and rappel down its face, I didn’t think of my kids back home. My life didn’t flash before my eyes. I thought of nothing other than how scared I was. I tried to keep a smile on my face though as I got to face this fear with Tanya by my side. Tanya volunteered to go first. She bravely turned around, stepped over the edge, leaned back, and made her way down. I wasn’t quite as graceful. I crawled out to the edge, turned around, grabbed on to my guide’s shoulders, then his legs, and slowly straightened my legs and leaned back. My confidence grew when the guide verified that the rope was holding my weight. Not looking down once, I slowly rappelled down, stopped for a picture about halfway, and then celebrated when my feet touched the ground. I won’t say that I’ve overcome my fear of heights, but I accomplished something that I never thought I would. If my body didn’t hurt so much tonight, I’d probably be standing a little taller than I normally do. So, kids, if you’re reading this, just know that not everything in life comes easy. In fact, the most worthwhile things in life take tremendous effort – and they should. There is a chance that this may be the last blog post I ever write. In about an hour I will leave for my rock climbing and rappelling excursion in Skagway, Alaska. It's been a fun ride everyone, and I'm glad I "did genealogy first!" While I'm a little (a lot) nervous about today's trip, yesterday's whale watching excursion was a "blast"! We first found a colony of stellar sea lions. Most were bathing in the warm Alaskan sunshine, but a few were wrestling in the water. So fun to see. We also caught up with a family of humpback whales. Next stop was the amazing Mendenhall Glacier. All along, Alaska's mountains seemed to be showing off to us. Truly remarkable scenery! Returning to the ship, my quick 15 minute nap turned into 3 hours, so we missed the nightly formal dinner with our group. So we made our way to the buffet on floor 11 and enjoyed curry chicken on rice, ham salad, and chilled strawberry soup. Yum, yum. The evening's entertainment consisted of a medley of instruments and singers. My favorite was a violin and guitar duet medley of songs from "The Sound of Music." Once again I was reminded of my mother who introduced music to me. It's been one of the joys of my life. By ten o'clock, the night was still young so we took in "The Jungle Book" in the cinema with our friends Chris and Trini. I tried really hard, but the movie watching turned into the second nap of my day, and so afterwards I was refreshed enough to go outside for a view of the northern lights. By 12:15am or so we hadn't seen any and so we tucked ourselves into bed. This morning Chris told me that they went back out at about 12:45am and got some great pictures of the lights. This is the last-ever blog post before I do the scariest thing I've ever done. It's been a good ride, I've loved nearly every step of my life's journey, and I have a great family. I hope to be writing here again tonight, but if not, life is indeed short - do genealogy first! The sun has set on the waters of Alaska and I'm truly thankful for the beauty of this part of the world and for the experiences of today. My day began early. While most of the 2,500 passengers were still sound asleep, Ken, Diane, and I were preparing the conference center for our first day of Legacy classes. After setup we had a nice breakfast of scrambled eggs, bacon, corned beef hash, fruit, and orange juice. I love breakfasts on cruise ships. Introductions were at 8:30 where we learned from each attendee how long they've been using Legacy and where they came from. Our furthest-away attendee was all the way from Australia, wow! Lunch today was a delicious salad and lamb-filled pita, followed by a small bowl of...you guessed it...ice cream. Towards the end of lunch we started noticing small chunks of ice in the ocean. This meant we were getting closer to one of the wonders of Alaska - the Hubbard Glacier. From a distance, I guessed the ice was about ten feet high. My wife guessed thirty. Boy did we ever misjudge the magnitude of what we were about to see up close. Hubbard Glacier is about 700 feet high and measures 76 miles from its source to the sea. We learned that the ice at the sea was more than 400 years old. The highlight of our trip to this point was the massive chunks of ice that crashed into the water. This glacier calving roared like thunder. It was beautiful seeing how active nature was. Later we found the ship's pool table which had a built-in leveling device. I don't think it was working very well though as we scratched on the opening break, followed by the eight ball ending the game much too early. Fun nonetheless. After a short nap (cruising is hard work) we learned that it was formal night, and so I quickly hung up my clothes in the shower, steaming them to get the wrinkles out, and then learned that I forgot my tie. Oh well, there were others without a tie at dinner, and the food still tasted good. I surprised myself when I ordered the "catch of the day". This is when I realized how much my taste buds have grown up over the last 12 years of Legacy cruises. I used to be a hamburger and steak guy at every meal, but I'm now taking risks with my palette. It goes without saying that once again, the meal was delicious. At desert time, I couldn't decide if I wanted the lemon pie or the strawberry cheesecake, so I ordered both. On our way to the evening performance we discovered that the ship had a cinema on board so we stepped in to check it out and ended up watching a great comedy - Mother's Day. So we missed the main show, but made up for it by finding the 24-hour pizza bar near the pool. After a slice of chicken and a slide of pepperoni, and a coconut cookie, we called it a night. And now that it's well into the wee hours of the morning, I'd better get to bed. We've got a big day of whale watching ahead of us. Day one of our 13th annual Legacy Genealogy Cruise has come to a close. I'm now in my 22nd hour of being awake, and my wife says I've done some of my best writing when I'm half asleep, and I promised you a daily report. Tonight's will be brief. Cruisers flew into Anchorage, Alaska from around the globe. We met at the Alaska Railroad Depot where we boarded the train for the 4.5 hour scenic journey to Seward. Not having studied my itinerary very closely, this additional excursion was a surprise to me, but a very welcome one. We saw mountains, glaciers, lakes, and even some traveling salmon. I kept a careful eye out for moose, bears, and whales, but didn't see any yet. It was wonderful seeing so many old friends we've cruised with previously, and it was fun meeting many of our Webinar Wednesday viewers in person. Arriving at the ship, it was just as majestic as expected, although I wish I would not have packed my winter coat in my suitcase. Going from the 90s in Idaho to the windy 50s in Alaska was a big change, but the warmth of the dining room with its unlimited buffet and, of course, ice cream and hot chocolate, warmed us up. Early tomorrow morning we begin our first day of classes where I will first teach "Using Legacy as a Research Tool". 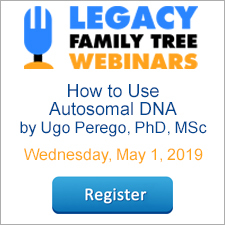 I'm looking forward to this brand new class where I will introduce my recent experiences with genetic genealogy and then show how to best use Legacy to keep track of the findings and link the DNA tests to the Media Galleries. Next, I will teach "Digital Pictures and Legacy" where we'll explore all of Legacy's multimedia capabilities including reports, charts, and locating missing files. I'll also get to show how I utilize the brand new Google Photos to backup and share my digital images via the cloud. For our last morning class, Ken will be teaching "Locations, Mapping, and Legacy". He always has some great insights and I'm looking forward to learning from his perspective as one of Legacy's developers. As much as I'm looking forward to teaching, eating, exploring, and eating some more, I am honestly even more excited about the divorce case papers of one of my Brown ancestors I received the day before I left. They had so much more than I hoped for - I'm finally going to be able to find Marsden Brown's children and their families. I'm already planning for a new Watch Geoff Live episode for when we return. That's all for tonight. I hear the northern lights are visible tonight, so I might sneak up to the top deck before retiring to bed. And to my mother and father-in-law who are home with our children - thanks so much and give them kisses for us! Tomorrow we leave to begin our 13th annual Legacy Genealogy Cruise, this year to beautiful Alaska. We will depart from Seward and visit Hubbard Glacier, Juneau, Skagway, Icy Strait Point, Ketchikan, and Vancouver, British Columbia. We will sail on Royal Caribbean's Radiance of the Seas. We've also got lots of Legacy classes planned and time for one-on-one and small group sessions. Last time we sailed through Alaska (2006) I did so without my wife. She gave birth to our 3rd child a few days before we left. Some timing, eh? Before we were even engaged, we decided that a trip like this to Alaska would be something we wanted to do together some day, and nineteen years later that day is finally here! I'm looking forward to most of the excursions we have booked. But since on prior cruises we've already bicycled down mountains (Norway), zip-lined through rain forests (Costa Rica), paddled down rivers (Jamaica), and snorkeled in the ocean (Hawaii), we, or should I say, my wife decided that we would give rappelling a try. Normally, this would be the last thing on earth that I would ever try as my fear of heights is incredible. Yet I agreed. I may, or may not get off the ship that day. I'll let you know all about it, either here on our blog, or over on our Facebook page (or both). If you see lots of great articles and pictures, and then they all of a sudden stop on the day of our rappelling trip, then you'll know that the first part of my new genealogy t-shirt, "Life is short..." may have come true. I may even try out the new Facebook Live broadcasting tool. You can also follow the ship online. Always know where the Radiance of the Seas is here. While we won't have our weekly webinars while we're gone, I have unlocked the entire "Watch Geoff Live" series for the duration of our trip. Look for them here. It's good for 10% off anything at www.LegacyFamilyTreeStore.com or www.FamilyTreeWebinars.com through Friday, September 9, 2016. Our sincere thanks go out to our entire technical support and sales staff who will continue to provide sales and support services while we are away. Thanks Dave, Pegi, Ron, Michele, Sarah, Bryan, Marian, Jairmie, John, Debbie and Leonard for keeping us afloat! Transportation to Seward, port charges, gratuities, government fees/taxes, and optional tours are extra. Pricing for the pre-cruise tours + the cruise begin at $4,058 per person (above exclusions apply). For class descriptions, frequently asked questions, descriptions of the places we'll visit, or pictures of our past cruises, visit http://www.legacyfamilytree.com/CruiseInfo_2016.asp.